Born on June 28th, 1712, at 40 Grand-Rue in Geneva, Jean-Jacques Rousseau was a prominent philosopher, author, and music composer whose political philosophy had a tremendous impact on the 18th-century thoughts and on the French Revolution in particular. Since his mother passed away nine days following childbirth, Rousseau and his brother, Francois, were raised by their father, Isaac Rousseau, who came from a middle-class family. During childhood, he used to read escapist stories rich in romantic notions regarding human life, which later influenced his work. Rousseau left Geneva at the age of 15 and he was sheltered in Turin (the capital of the French region Savoy) by Francoise-Louise De Warens, who was paid to convert Protestants to Catholicism. Rousseau idolized De Warens and he often called her “maman.” She also provided Rousseau a formal education encompassing various fields and introduced him to important Catholic clergy members, thus helping him develop into an educated musician, philosopher and man of letters. At the age of 30, Rousseau moved to Paris for a while and then left to work as a secretary in Venice. He returned to Paris where he befriended famous French philosopher Diderot. In 1950, he wrote an essay entitled Discourse on the Sciences and Arts, also known as the First Discourse, because this was his first important published philosophical work, which propelled him to fame. In this essay, he argued that sciences and arts have a negative impact on human morality. In 1954, he returned to Geneva where he regained his Genevan citizenship and reconverted to his first religion, Calvinism. In 1955, Rousseau published his second important work entitled Discourse on Inequality among Men ( or Second Discourse ), in which he discussed two types of inequality – natural (physical) and political (ethical). He emphasized the fact that moral inequality, as established by convention, is an intrinsic part of any civil society and it leads to significant differences in power and wealth. Rousseau was a fervent supporter of the theory of the natural human and considered as guidelines the hypothetical state of nature, a concept in political philosophy primarily used in social contract theories describing the conditions preceding governments. He also stated that the stage in human development associated with “savages” was the optimal one. He believed that only the constant cultivation of duty and strong civic morality can truly ennoble the individual in any civil society. 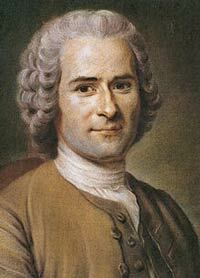 Rousseau’s philosophical work involved the dual concern bearing a material dimension as well as a psychological dimension, the latter being more significant, because the sense of one’s self is intrinsically derived from the opinions of others, which ultimately destroys individual originality and restricts freedom. Rousseau passed away at the age of on July 2, 1778, at the age of 66 in Ermenonville, France, after suffering a fatal hemorrhage. Originally buried in an Ermenonville cemetery, his remains were transferred in 1794 to the Pantheon, a mausoleum in Paris.